I have always wished I were more of a fan of summer squash. On its own, it tends to be watery, chalk-tasting and pretty bland. Add some fresh herbs and a bit of cheese and toasted breadcrumbs, then I’m interested. When I saw this recipe for a summer squash gratin in the current issue of Food & Wine, I decided to try it. I cut the recipe down for serve just Larry and me, added some fresh herbs from the garden and turned down the suggested oven temperature to offset my hot oven. 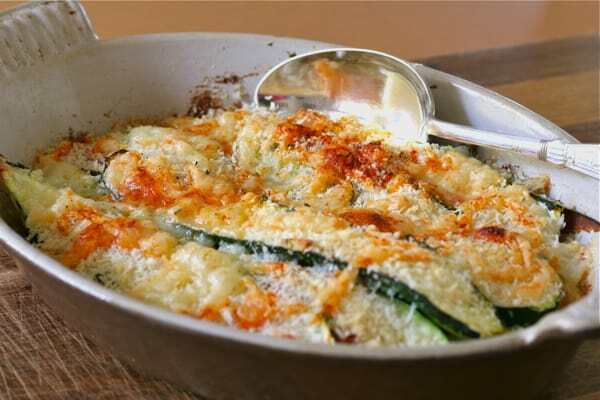 Of course, this recipe is not a true gratin in the classic sense, but it pulls together quickly for a summer supper or side dish. A simple dish of baked summer squash topped with panko and cheese. Butter a gratin dish or shallow baking dish and set aside. Combine the sliced zucchini, olive oil, garlic, salt, pepper, dill, thyme and parsley in a bowl and toss together. Arranged the tossed zucchini in the gratin dish. Bake for 20 minutes. Sprinkle with panko, then the cheese and dust with paprika. Bake 10 minutes more until golden and bubbling. Serve at once. I too wish I were more of a summer squash fan, especially when I used to be faced with so many grown by my mother in law! This sounds a great way to enjoy squash, I love a good summer dish! Dianne, maybe you can grill it with some of the “dates” you foraged – such a terrific post that made me laugh out loud. Simple and tasty – I’ll make this again, Greg – hope you try it. Looks great – thanks for your comment! We get squash for the dog and spiralize it, but I never make much with it. I’ll have to give this one a try – looks like a good dish for the toaster oven! Toaster oven would be great – keep your pretty kitchen cooler. Looks delicious! Always looking for something tasty to do with squash. Love F&W recipes in general. Miss that magazine so much. I like F&W too – why not renew your subscription?